The paragraph shown above, copied verbatim from the initiative, is the real core of Measure D.
It says that we would not be able to change any aviation use of the airport — no matter how small — without first voting to close the airport. But if Measure D passes, will will not be able to close the airport, because they have redefined “voter approval” to make it effectively impossible. It means we could not improve the health and safety of our community because we will not be able to reduce the frequency of flights, the type and size of aircraft, hours of operation, the sale of leaded fuel and jet fuel, or any new safety measures, pollution limits, or noise abatement. We also would not be able to shorten the runway to create a safety zone (which would also limit the largest jets from using the airport). We could not reduce or eliminate flight schools. None of that could happen, and we’d be stuck with the current pollution, safety hazards, and nuisance of the airport. 1. Measure D would make it impossible for us to manage the airport to address health and safety issues. 2. We cannot make any changes to management of the airport unless there is a vote to close the airport. 3. Measure D makes it effectively impossible for voters to actually vote to close the airport. Don’t let their deceptive, circular logic keep us from managing our own land. Vote NO on Measure D.
Yes on LC, No on D has been overwhelmingly endorsed by community groups and organizations, elected officials, candidates, community leaders, and local residents. This post gives an overview of the controversy regarding aviation at SMO, including a look at safety, pollution & health, noise, jets, Santa Monica city & tax payer finances and more. 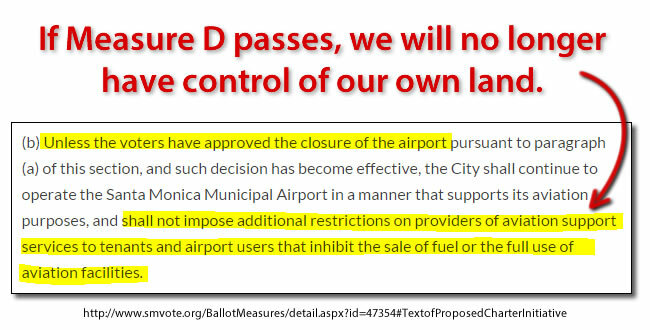 A history of the dispute over Santa Monica Airport ownership between the City and the FAA, as well as of the mounting opposition to the airport from the impacted residents in the surrounds. Learn about the two different ballot initiatives related to SMO. The City’s initiative limits development & encourages the construction of a new city park. The aviation lobbyists’ initiative ensures no changes are made at SMO.